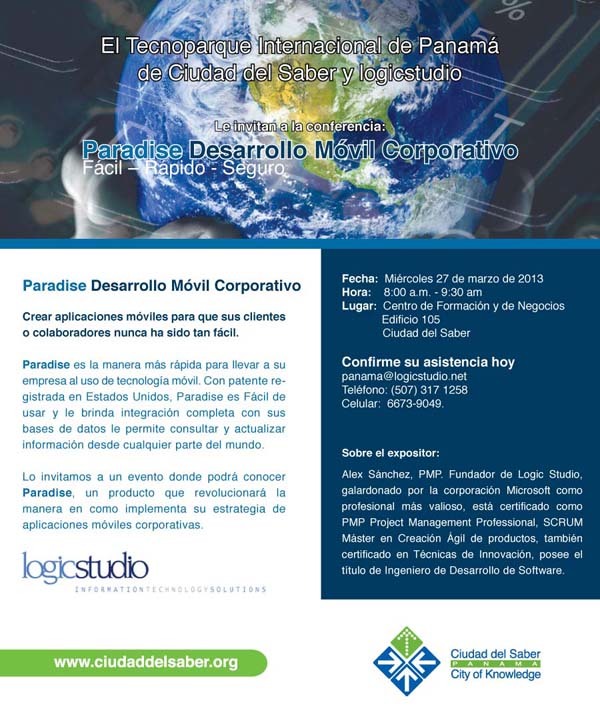 Paradise is the fastest way to take your company to mobile wave. With US Patent, “Paradise” is easy to use, work in every mobile device and has a complete integration with corporate systems that allow make updates of your information from anywhere in the world. The International Technopark of Panama’s City of Knowledge and Logic Studio invite you to the *free* conference: Corporate Mobile Development Paradise, to be held on Wednesday, March 27 from 8:00 am to 9:30 am in the Business Training Center, Bldg 105, City of Knowledge.